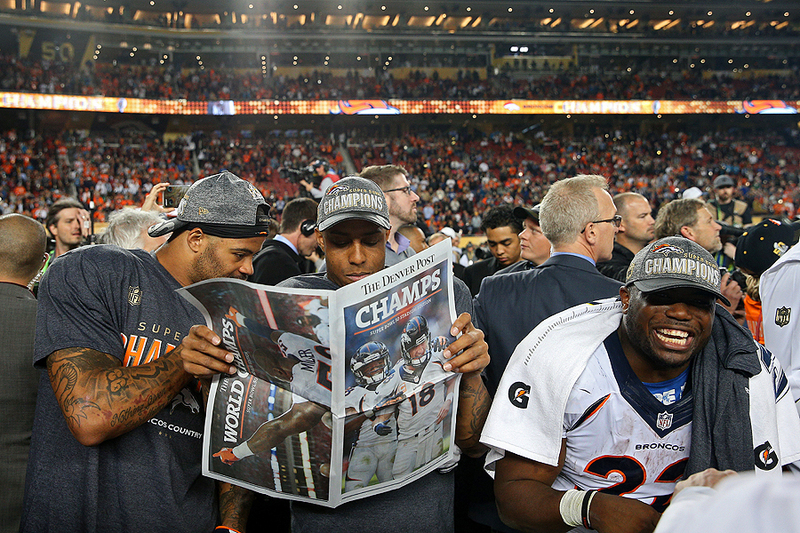 "Cody Latimer and Andre Caldwell of the Denver Broncos read a newspaper as they and teammates celebrate after defeating the Carolina Panthers, 24-10, in Super Bowl 50 at Levi's Stadium on February 7, 2016 in Santa Clara, California." The holy grail of football - The Super Bowl. It can be argued that this one game is one of the biggest in the United States - if not the world. So getting the opportunity to be on the sideline with Getty Images for the one of the most watched single games is an honor. But as sports goes, sometimes the ball bounces your way and other times it doesn't. While I cannot say nothing happened in my quadrant, I think some of the bigger moments visually occured at the other end of the field - but I am okay with that. Being apart of the team is just as important as scoring the winning touchdown in my opinion. Without a block by the line, without a play call by the coach, and simply overall, without teammates, nothing can be achieved. It's a team effort. While there were some key plays documented in my zone, it was this post game picture that ended up being my one of favorite. While not as iconic as Peyton Manning holding the Vince Lombardi trophy or Von Miller stripping Cam Newton in the fourth quarter, it makes me ask questions. There is something about winning globally one of the biggest sporting prizes and taking the a second to look at a newspaper printed with visuals that sings.